WE LOVE WESTIN KIERLAND! 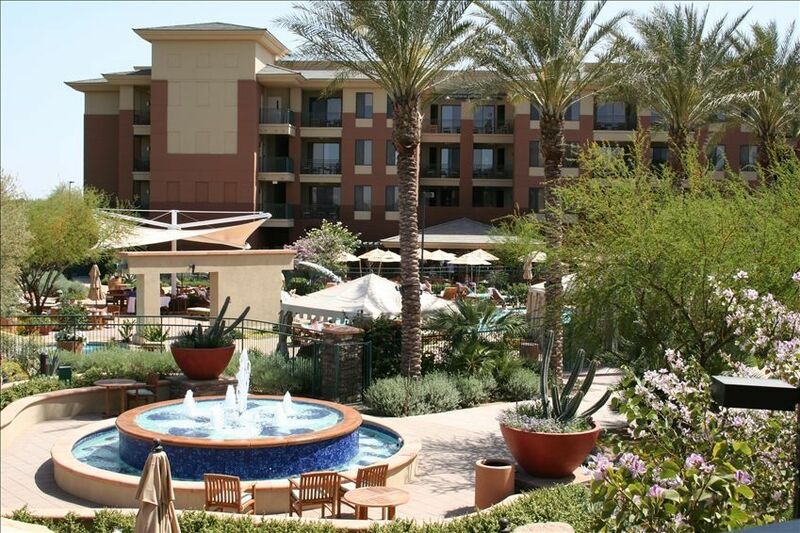 The Kierland Villas are fabulous and adjacent to the Westin Kierland Resort & Spa. Guests at the Villas have access to all of the Hotel's amenities and pools. VILLAS: They are recently updated and absolutely gorgeous - clean and modern (granite counters and Kohler fixtures). Our unit is 1400 square feet - perfect for large families or 2 families traveling together. It's a 2 Bedroom Lock off - 2 separate suites with an adjoining door. The larger unit (868 sq. ft.) has a King bed, full kitchen, dining for 6 and a bar counter/2 stools for eating. The smaller unit (546 sq. ft.) has a King bed, kitchenette, dining for 4. Both units have stack-able W/D and pull-out sleeper sofas in the living room. Each unit also has either an enclosed patio (ground floor) or balcony. PROPERTY: There are 6 buildings (all with elevators) that are situated on the golf course and/or by the pool. There is a pool bar, market onsite (that offers pre-stock groceries/made-to-order food items), workout room with sauna/steam room, relaxation pool, adventure pool (with slide and volleyball net), and wading pool for the little ones. There are also cabanas to rent and a game area with giant chess & checkers, ping/pong, pool table, and a putting green. There are several outdoor BBQs, fireplaces, and hammocks/couches. And don’t forget the Kierland Golf Club with three 9-hole golf courses, UNWIND Hour at 'Deseo' and the Agave Spa offering full spa services and yoga. There are also daily activities at both the Villas & Hotel along with 2 Kid’s Clubs. LOCATION: Means everything - Walking distance (or shuttle) to Kierland Commons and Scottsdale Quarter , upscale outdoor shopping malls with plenty of stores and restaurants. We are also a short drive to Old Town Scottsdale, and downtown Phoenix. COST: Well below what both the Villas and Hotel offer. Their rates are between $600-$800 per night for a ONE bedroom unit. Our rate is $4,200/week for a 2bedroom! We have lots of suggestions and ideas for things to do/see onsite and off property. We know you'll love it as much as we do! We used to live in AZ and Scottsdale is the mecca of golf, sun and fun! Westin Kierland Villas is in a premier location within walking distance (or shuttle service) to Kierland Commons and Scottsdale Quarter. Also, being able to share amenities over at the Westin Kierland Resort & Spa is a plus! Some of the buildings have balcony views of the Golf Course at Kierland Golf Club. Paper towel, a few garbage bags, toilet paper, dishwashing detergent, dishsoap and mini-box of laundry detergent are provided initially but not re-stocked. Onsite Market, Pre-stock grocery service, Concierge, Kids Club, Poolside Bar, Relaxation Pool, Wading Pool, Family Pool with Water Slide, Lazy River * The villass only offer a mid-week housecleaning service.